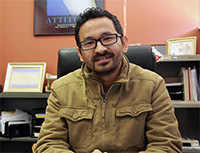 A case worker at the International Institute is tired of seeing the depression, substance abuse and suicidal thoughts that overwhelm some of his fellow Bhutanese in Akron. The suicide rate among refugees is nearly double what it is for U.S.-born residents, says Amber Subba, (pronounced Ahm-ber), who is co-hosting a “Stop Suicide” event Feb. 28, 1 p.m. at North High School. The event will include live music, and local mental health professionals will attend to spread the message that help is available for residents battling with depression.